Busy in fact heaving as expected for this fine pub on a Saturday evening, I found a table in the lobby area which thankfully was a lot cooler compared to the heat and humidity around the main bar area. St Austell - Proper Job 4.50 I think this is the first time I've tried the non bottled version - spot on nick and expected flavours minus the bottling carbonation. Late evening visit. Good, chatty, wise locals at the bar. Afternoon visit and only a few other customers. Evening. Very quiet but it is rather out of the town centre. End of the beer fest, Sunday lunchtime. About 20 beers not mentioned. 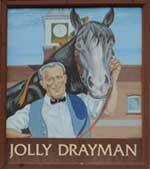 Jolly Drayman - Jolly Drayman Festival ale 6.50 1 and a half litres of rum and kent porter went into each cask. Well over the top. Made for uncomfortable drinking with a sickly taste. A busy Sunday evening, it was the last day of the pub's three day beer festival which would appear to have been very successful as many of the beers had sold out. Fyne - Avalanche 4.50 Delicious straw coloured ale, with a hint of lemon and grapefruit. Kent - Pale 4.00 Easy drinking pale ale. Afternoon visit, a couple of others in. Quiet back street locals pub. The pub is found in Gravesend, Kent, DA12 1JA. 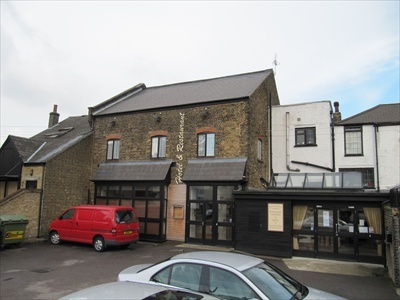 This is a ex Charrington's pub and hotel that was once part of Walker's Gravesend Brewery which ceased brewing in 1928. The brewery office can be seen on the opposite side of the road in Wellington Street. At one time a regular CAMRA Good Beer Guide entry - certainly featured in the first 25 editions consecutively. Low ceilinged single bar with 5 handpumps. We have visited this pub 11 times, seen 31 different beers and tried 16 of them.